With each word set in this puzzle, you get a new grid full of words based on the theme of your choice! There are ten different themes, each with around a dozen words, from simple ones like colors and fruits to the more difficult European Union country list, as well as fun themes like Twilight, the Disney universe, and other movies. Click and drag your cursor across an entire word to scratch it off your list. As you go through the puzzle, you’ll be scored based on how well you do. 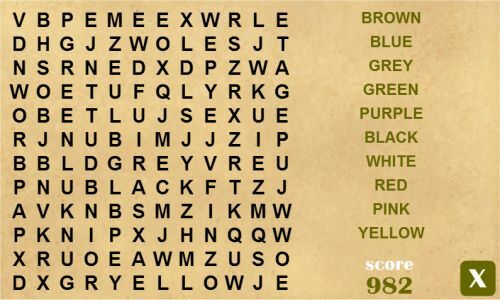 Find the words faster to get more points! The words can travel in any direction – horizontal, vertical, diagonal, and even backwards. This puzzle is ideal for grades 1 and 2.